Thanks so much for the great trip. Mary and I really enjoyed the entire experience and would do it over again in a heartbeat. I have talked to Jen and Jane at Weaver’s Dive Shop and they are going to start getting in touch with other shops that are likely to have an interest in marketing the sardine run and safari. Mary and I both agree, this is the best trip/vacation we have ever had in our lives!! You may quote us. "This was my second trip to experience the Sardine Run. It did not disappoint. 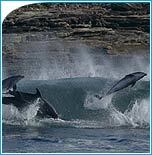 Fantastic whale and dolphin activity every day. The sardines were elusive as always but we ended the trip with a bang - 7 bait balls in one day! And the icing on the cake - witnessing a 75- meter diameter bait ball from a micro-light while a tornado of gannets dive-bombed it time after time. Unforgettable! The SEAL team was top-notch as always and made sure we had an exciting but safe experience. I'd do it again in a heartbeat. Howzit team! I think I finally adjusted to reality again. I had an absolutely incredible trip! Each day just got better and better. From the excitement of the launches, to being in the water with the dolphins, whales, sharks and birds to retelling the stories of the day over a cold one at the lodge. Then, to top it all off, an amazing mountain bike safari in Botswana! I will have to forward the video of the leopard. I still can't believe we were up close to him and the other wildlife. As I was told, Africa hooked me! I will be back. Nalyn and I would like to express our sincerest gratitude to such a memorable time during our 2 Oceans Extreme vacation back in May 2007. As our personal tour guide for just the two of us for almost all the 14 day trip, you gave us a rich experience into the South African culture. While we did not have the opportunity to see the Knysna seahorse due to the inclement weather, we were able to see all the animals on our hit list that we don’t get here in Hawaii: great white sharks, ragged tooth sharks, zambezi sharks, elephants, rhinos, lions, leopard, hippos, penguins. We were able to see the tiger sharks and sea lion. The diving and safari were awesome; but I think we most enjoyed getting to know you and your staff (Mark, Steve, Brad, Jackie, Megan). Please give your staff our warmest Aloha! Relaxing over meals or coffee with just us was special. The personal tours of the wineries, Cape Town, Durban, Oribi gorge, and the Oribi bungie swing will never be forgotten, nor will the knowledge of local culture. Thanks for teaching us about rugby and introducing us to Johnny Clegg’s music. The only difficulty was packing and unpacking between hotels. But we realized that was a necessary evil in order to see as much as South Africa as we did between the Atlantic and Indian ocean coasts. While the Sardine Run is your signature event, I think the 2 Oceans Extreme package is just as worthwhile for seeing South Africa for the topside and diving experience. You and the SEAL team went beyond our expectations. Nalyn and I are so happy to now have people we call friends in South Africa halfway around the world from Hawaii. See you in next year at the Sardine Run! I would like to thank both Nic and the Sardine Run.net team for making this trip a very enjoyable, memorable and unique experience. Kind regards and happy diving! 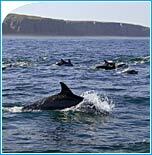 If you want conventional holidays, forget it, but if holidays are special moments to experience, think about Sardinerun.net. The Sardine Run was everything I had hoped for and I'll probably be back for a second helping one of these days. I would like to say a big thank you to you for giving both Vicky & me a fantastic trip in South Africa. You exceeded my expectations in terms of all the great things we did and in going out of your way to make sure that everyone had a cool time. The trip was wonderful and surpassed my expectations. The cage dive truly was unreal. Thanks for all of the hard work and attention to detail, it certainly made for a wonderful introduction to South Africa. Thx, we had a wonderful time...lots of memories. I really appreciate the teams enthusiasm and efforts to make it a memorable trip. Re-entry in to the routine here in the states was actually pretty smooth. Still can't get South Africa out of my system, it truly was a fantastic trip! Good luck, I wish you well. I just wanted to thank your team for a fantastic time. I must admit though, I feel like I've come back to work for the rest! The trip was definitely worthwhile and I'm sure that I will be visiting South Africa again in the future. "Even after 8 days on the water you still wanted more. My experience was one that I will never forget and has left me wanting to see more of Africa and return each year to the annual migration of the Sardine Run. I wish to thank the entire Team that made my trip safe, fun and most of all, unforgettable. Thanks again for giving me one of the greatest trips I have ever experienced." I wanted to personally thank you for the great time I had the last few weeks both on the Sardine Run and the Cycle Safari. The entire trip exceeded my expectations in ways I had never imagined it could. I've already started plans for a future trip!" Matt Moreno - Atlanta, GA, U.S.A. I want to start off by saying 'WOW'! Sharks, Whales, Mantas, Dolphins..the activity of animals exceeded my expectations. The knowledgeable and professional crew were awesome. The effort that is put into 'running the show' is very evident. All working together to achieve the same goals. You strive to be the best with personal touches, safety always in mind, and using the best equipment. This life changing experience and the unforgettable memories will always be in my heart. I had the pleasure of spending 3 weeks with the Team. Wishing I could have stayed longer, but you were out of red wine! Thank you all for the sharing one of the best times of my life. 'World Class' will always put a smile on my face. This is extreme diving at it's finest! 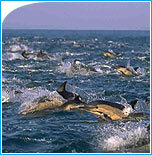 "It just does not get any better than the sardine run!" I can't say enough about one of the most amazing experiences on the planet. If you love sea life and adventure then you must do this trip before you die, period. Swimming with whales, playing in pods of hundreds of Dolphins, having sharks circle you, watching whales breach 20 feet away from you, flying in a micro light over some of the most glorious beaches in the world, plunging through waves on a high speed boat, the list goes on and on. All the while you are getting VIP treatment by some of the friendliest, most professional and organized crews I've ever seen (and I do this sort of thing all the time). You're about to have one of the greatest adventures of your life. I personally guarantee it, come see me if you're not happy and I'll write you a check out of my personal bank account. These guys rock and there is just no comparison!!! "I had an absolutely fantastic experience. Where else in the world can you be in the water with humpback whales, 2 species of dolphins, 4 species of sharks, and dive-bombing gannets all before lunch? I didn't get the bait ball experience I had hoped for, but there was so much else that was so great that I will be back next year to try again". 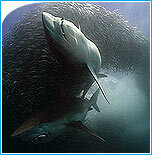 "The Sardine Run is in fact one of natures spectacles and was definitely a life-time experience! …….I hope you can appreciate from my images just how simply beautiful and amazing this natural occurrence of feeding frenzies can be. At last count I experienced 25 things that were brand new to me." "The only thing more impressive than the wildlife above and below the water was the flawless organization--the team thought of everything to make the trip absolutely perfect. Stellar all around!" This was definitely one of the top 5 experiences I have ever had and I consider myself well traveled. My first impression of the crew was truly first rate. They possessed all the makings of a great trip. They were very professional, well organized, sophisticated and very knowledgeable as well as safety conscious (which is very important to me when researching trips of this nature). My second impression was the accommodations which were situated in one of the most beautiful setting. The lodge was very clean, the staff very polite and friendly and the food was prepared by a wonderful chef that caused me to put on a few pounds. My final impression and the reason I traveled 35 hours each way was the diving/snorkeling experience along side the sardine run. I decided to make this trip because I thought it would be a "once in a lifetime experience" and it was. It was nothing I have ever experienced but now a "must do" experiencing again. Every day was a gift from nature. I still can't believe that on my first day in the water, two Humpback Whales swam right up to me and gracefully passed me by within touching distance. But that was only the first day...Over the remaining days, thousands of dolphin swam with me for hours and then again joined in on a high speed race to our next location. Of course there were also all types of sharks that were amongst us waiting patiently for the bait ball, yet wonderfully curious about us in the water, however I never felt unsafe. I was happy these beautiful animals didn't stop coming . 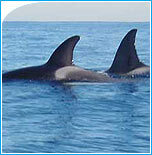 . . Manta Rays, Whale Sharks, more whales, sardines and thousands of birds.....it never seemed to end. Every day something different. It was again one of the top 5 experiences I have ever had! I feel my heart beating with excitement just writing about this! Thank you for an amazing life experience!!! Just want you to know that Henrik and I had a fantastic Sardine Run with at least 100 Humpbacks, 1 rare Southern Right Whale :o), 1000 of Dolphins and some very close interaction with sharks :o) and of course Sardines. 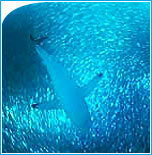 The first day before lunch we have seen it All, so you have my biggest recommendations for the Sardine Run expedition. I have dived in the Galapagos, Palau, Sipadan, most of Thailand and Mozambique and must say that this has been the most adrenaline and exciting dives I have ever tried!!!! This trip was truly one of my favorite trips of all time. And of course I will be back!! I have dived all over the world and seen many wonders of the underwater world however the Sardin Run experience is something I will remember and treasure for the rest of my life. Seeing mother nature at her wildest spiced with plenty of humpback whales makes it a truly unique. Nic, thank you for setting this up commercially so it is not alone for IMAX guys and blue planet photographers to experience! I had an AWESOME time at the sardine run ! And would totally love to go back next year ! And maybe stay longer. The highlight of my trip is that I FINALLY got to see a WHALE !!!! And got photos as well, both topside and underwater ! 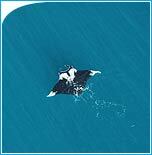 I have been very lucky to have been in the water with whale sharks on many an occasion, but never a whale ! The Sardine Run was such a magical trip of adventure, excitement, and sheer beauty. Whether by sea (with the whales, sharks, dolphins, and sardines) or by air (the Wild Coast should always be seen via microlight) or by land (the horses, the rainbows, the waterfalls, the biking, and the sundowners) Africa is a place like no other. But what made the trip truly unforgettable was the staff. I was so impressed by the best and brightest who came from all over South Africa to enhance the experience with their enthusiasm,humor, and intelligence. And the Botswana Cycling Safari was extraordinary - I've discovered my inner mountain biker in ways I never imagined. The entire New York group agrees that this is one of the best experiences they've had. It was definitely a holiday I'll remember forever. Thank you! Thanks for the memories and the friendships to last a lifetime. All the Best! Thank you for the "Rock 'n Roll" - we will be back!! I'm definitely planning on doing it again! I wanted to tell you that we were very happy with you and your staff, I appreciate all you kindness and professionalism for this trip. We have no words to thank you for all that you and your team have done to help us every second of our wonderful trip to this gorgeous country. We will never forget you all, FRIENDS. All content contained on this website is protected by international copyright laws.